Located in Chambers County, Lanett, Alabama, was chartered as “Bluffton” in 1865. Its location on the Chattahoochee River led to the construction of cotton mills, as the town became a regional industrial center processing the cotton grown on the area’s farms. Bluffton was so connected to these mills that the town changed its name to Lanett, in honor of Lafayette Lanier and Theodore Bennett, early textile mill owners. The local newspaper, the Chattahoochee Valley Times, ran several pages in every issue detailing news from each mill. Lanett, Alabama, and West Point, Georgia are true twin cities, located right next to each other across the Chattahoochee River. Streets that begin in Lanett end in West Point. Jews in West Point and Lanett formed one close-knit community that thrived for over a century before withering in recent decades. The story of the Jewish community in Lanett and West Point begins with the friendship of two immigrants in Philadelphia, Pennsylvania. Heyman Heyman was born in Prussia in 1825 and came to the United States in 1852, first settling in Philadelphia. There, he befriended the Bavarian-born Louis Merz. The two decided to move to LaGrange, Georgia, where Heyman worked as a bookkeeper in a Jewish-owned store while Merz peddled merchandise in the surrounding countryside. When a railroad was built connecting LaGrange to West Point in 1854, the two friends headed west, opening the dry goods store Heyman & Merz in West Point. Louis Merz’s sister Betty had immigrated to Cincinnati. On business trips north, Heyman would often visit her. The couple got married in Cincinnati in 1859 with Rabbi Isaac Mayer Wise officiating. Heyman then brought his new wife south to live with him in West Point. Another Merz sibling, Daniel, came to West Point in 1860, joining his brother and brother-in-law’s business. In 1860, Heyman and Louis Merz were thriving. Heyman owned $1,200 in real estate and $6,000 in personal property at the time. Their success was soon interrupted by war and tragedy. Louis Merz joined the West Point Guards at the start of the Civil War and was later killed at the Battle of Antietam. Dan Merz and Heyman remained in Lanett during the war, buying a tan yard and tanning leather to make boots for Confederate soldiers. After the war, the Jewish community grew, much of it around the seven children of Heyman and Betty Heyman. Other Jews made their way to the area, often intermingling with the Heyman family. Prussian-born John Hagedorn came to West Point in 1872, and later opened the store J.J. Hagedorn & Co. He soon brought two of his nephews, Zach and Philip Hagedorn, to town to help with the business. In 1883, the foundation of the Jewish community of Lanett was cemented when Zach and Philip Hagedorn married two of Heyman and Betty Heyman’s daughters, Jennie and Lula. The Heyman and Hagedorn families formed the nucleus of the area’s Jewish community for much of the next century. It did not take Lanett and West Point Jews long to form a congregation. In 1859, the handful of Jews in the area came together to found Congregation Beth El (House of God). The congregation was always very small; it met in private homes for its first fifty years, though members did purchase land for a cemetery in West Point. The congregation embraced Reform Judaism, and later joined the Reform Union of American Hebrew Congregations (UAHC). In 1909, Betty Heyman donated a portion of her land that had earlier been a vegetable garden to the congregation for the construction of a temple. Beth El received contributions from both its members and local Gentiles to raise the $3,000 it took to construct the modest building, which was located in Lanett. Rabbi David Marx of the Hebrew Benevolent Congregation in Atlanta led the dedication service. 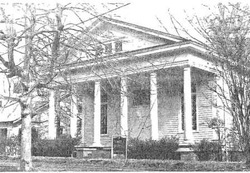 At the time of the temple’s dedication in 1909, about fifteen families belonged to Beth El, which attracted members from nearby towns like Opelika and LaFayette, Alabama, and LaGrange, Georgia. The congregation never had a full-time spiritual leader but brought in rabbis from other cities once a month to lead services, often on Sundays. Rabbi Marx came to Lanett to lead services for thirty years, until he was too elderly to make the trip. He was replaced by Rabbi Eugene Blachschlager of Montgomery, who served Beth El monthly from 1946 to 1965. After 1965, Rabbi Alfred Goodman of Columbus, Georgia, would travel to Lanett once a month. For the High Holidays, the congregation would bring down rabbinic students from Hebrew Union College in Cincinnati to lead services. One of these student rabbis was Alexander Schindler, who went on to become the president of the UAHC. When the temple was built, the small congregation began to elect officers and keep board minutes. Lee Heyman, the son of Heyman and Betty, served as the first president of Beth El, remaining in the position for over 40 years until his death in 1952. Milton Cohen, who had married Jean Hagedorn, succeeded Heyman, serving as Beth El’s president from 1952 to 1967. James Maxwell was the last president of the congregation, while Joe Herzfeld and Lee Herzberg were longtime officers. The small congregation had a Sunday school to pass on Judaism to their children. The Jewish women of the area founded a chapter of the National Council of Jewish Women. The group oversaw the maintenance and upkeep of the temple and also organized community programs such as the annual seder supper. Jews in Lanett and West Point were part of the local merchant class, owning stores that catered to the cotton mill workers and area farmers. In 1919, these stores included: Lee Herzberg’s, which sold men’s clothing, Solomon Brothers, which sold dry goods, and Lee Heyman and Co., which sold furniture and dry goods. Each year, these Jews would advertise in the local newspaper that they would be closing their stores for the Jewish High Holidays. Jews became active in civic life; Lee Heyman was elected to the Lanett city council in 1893, garnering more votes than any other council candidate. Lanett and West Point Jews had good relations with their Gentile neighbors. When the local Presbyterian Church was destroyed by a tornado in 1919, its members met at Temple Beth El for several years until their church was rebuilt. Jennie Hagedorn played the piano for the Presbyterian Church. When Beth El celebrated its centennial in 1959, the pastor of the First Methodist Church gave the invocation, the minister of the First Baptist Church gave the benediction, and a local Episcopal priest gave a “scriptural lesson.” Rabbi Milton Grafman of Birmingham’s Temple Emanu-El gave the keynote address. At the time of its 100th anniversary in 1959, Beth El had twenty-two member families, representing about fifty Jews. At their peak, the two towns never had more than 100 Jews combined. In 1937, thirty-two Jews lived in Lanett, while forty-one lived in West Point. Considering these small numbers, it’s truly remarkable that the congregation survived for over a century. By 1968, according to member Fannie Herzberg, “the congregation had grown woefully small, by death of so many members, and the moving away of others.” The congregation continued on until 1977, when it disbanded and sold the temple, which was later torn down. The religious artifacts from the synagogue were given to Temple Israel in Columbus, Georgia, where most of the remaining Jews of Lanett and West Point went for services. Though the congregation is no more, its memory is preserved.